We have been talking to our Yr4 – Yr7 pupils about keeping safe online, with particular reference to the Momo Challenge. Please read the information contained on the attachment carefully and talk to your children about keeping safe. 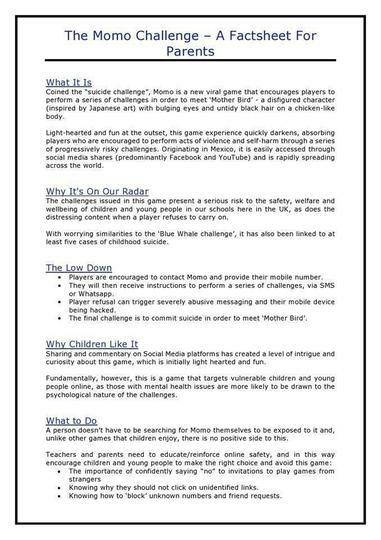 The internet is fantastic, amazing and wonderful, however, we are in danger of allowing the power of gaming, social media and peer pressure to take control of our children’s lives. The biggest threat to our children is not on the roads, or in stranger danger, it is in their bedrooms on their smart phones, tablets and games consoles. One good starting point would be to ensure that children do not have access to games or apps that have age restrictions above their actual age. The restrictions are there for good reason. 18 means 18! Children’s phones etc. should be put away and put off at bedtime. Good sleep is so important to children's development and learning capacity. Whilst I am not in favour of schools acting as the world’s policeman, I respectfully, and in all sincerity, suggest that it is irresponsible for any parent to allow their children to play such games, to download/use such apps, or to watch such films. Not to click on pop ups. If pop ups appear, tell mum or dad. Not to click on pop ups stating they have won a prize. There is no prize! Not to download apps, or to purchase game time without parental permission. Only to play shared games online with their existing friends. Not to accept friendship requests outside of their existing friendship group. To immediately BLOCK anyone who asks them to keep a secret from their parents and to immediately TELL THEIR PARENTS. We explained that children should never be afraid of telling mums or dads if pop ups appear etc. Mums and dads will not be cross and will be glad that they have spoken up. Our children must have confidence that they can talk to us about any subject, even if they have made a mistake, or clicked on something inappropriate. To take back power over apps such as the MOMO CHALLENGE by BLOCKING and TELLING. In group chats if a member of their friendship group is being mean, bullying, using bad language or speaking inappropriately, they should be told to stop and if they don’t they should be removed from the group. To remember that what is said in chats or online cannot be deleted. Not to share inappropriate photographs of themselves or others in chats or online. Together as parents and teachers we must educate and empower our children so that they can reap all of the benefits of new technology whilst remaining safe.